The Orchid Family contains the aristocrats of the plant world, with beautiful and gorgeous flowers whose wealth of colouring and perfume is unsurpassed. This wonderful family contains some of the most marvelous devices to secure cross-fertilization by the aid of insect visitors, and many orchids are absolutely dependent on insects for the propagation of the species. Our own British orchids are naturally much less spectacular and conspicuous than the great orchids of the tropics, growing under conditions of great heat and humidity and amid abundant insect life which encourages a much greater executive ability than our colder, less congenial climate. All our British orchids are geophytes, i.e. plants which root in the ground and include two saprophytic types which, however, are plants of the woodlands. 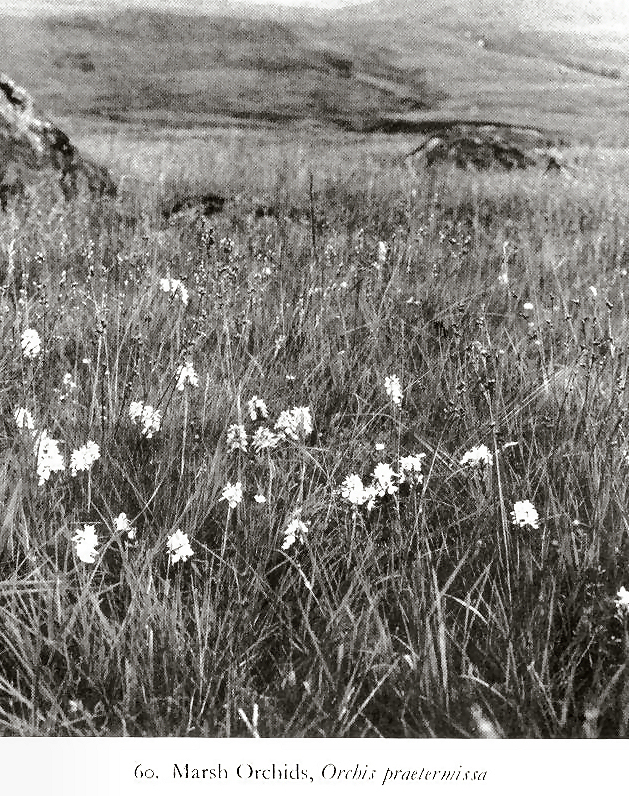 In the Highlands, we have eleven orchids, many of which are of common occurrence, especially in the meadows of the valleys and lower hillsides. They include the Early Purple Orchis (Orchis mascula), very common in damp meadows in early May and June; the Spotted Orchis (O. maculata), very common in the meadows and heathy pastures; the Marsh Orchis (O. latifolia), fairly common in damp, boggy meadows and pastures, where one may also find its less common variety (O. incarnata); The Butterfly Orchis (Habenaria bifolia), common in heathy pastures and meadows; the Sweet-scented Orchis (H. conopsea), found in similar places and just as common; the Small Orchis (H. albida), common in heathy pastures, and the Frog Orchis (H. viridis), which may be found in grassy meadows and on banks. Besides these meadowland species w also have the Creeping Goodyera, the Coralroot and the Heart-leaved Twayblade which have been described elsewhere in this book. I will endeavour in the ensuing description to describe the beautiful mechanism by which some orchids obtain cross-pollination. I will commence with the Butterfly Orchis, in which the flowers are large and the various organs of the flowers are easily discerned. Imagine, if you can, a June day in Lochaber when the sun is shining in a cloudless sky, and the soft wind blows gently up Loch Linnhe from the distant islands, ruffling the mirror-like surface of the sea, whilst a lark is singing high in the blue vault of heaven as he mounts steeply from his well-hidden nest in the flower-starred meadow. The mountains rise steeply from the sea, where their every feature is reflected in the azure depths, towards the majestic bulk of Ben Nevis dominating the interior, his sides slashed with slowly diminishing snow fields. I am standing in one of the small meadows which occupy the narrow strip of low, fairly flat land between the sea and the steep mountain sides, and have been wrested by the crofters from the bog and moorland with infinite patience and toil. These meadows are naturally wet, and often boggy, and are intersected by the numerous small streams that race down the mountains. In the south we are accustomed to see the meadows golden with Buttercups, or white with Ox-eye Daisies, but here the meadows are filled with Orchids and they are amazingly beautiful with the long purple spikes and handsome spotted leaves of the Spotted Orchis and the delightful creamy spikes of the Butterfly Orchis. The latter orchid is so called because the blooms are supposed to resemble a butterfly. In this case, however, the name is not so appropriate as in the case of the Bee Orchis of Fly Orchis, which are amazing imitations of these respective insects. 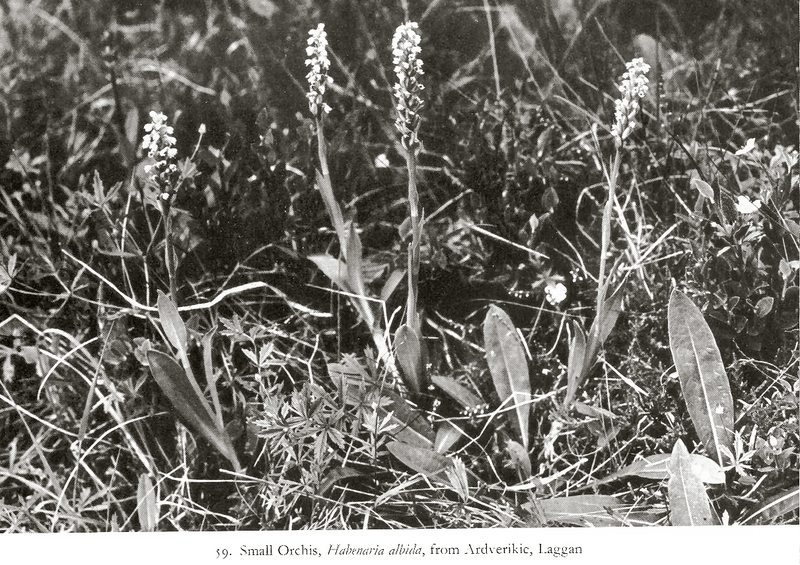 In Britain we have two types of this orchids; they are the Greater Butterfly Orchis (Habenaria chlorantha), a large and very beautiful species confined to moist woods and much more common in the south, and the Lesser Butterfly Orchis (H. bifolia), the type so common in the Highland meadows. If we were to dig up one of these orchids we should find that the short stem is buried deep in the ground, and springs from a pair of white, fleshy, tuberous roots, one of which is larger than the other. The larger tuber is a storehouse from which the present leaves and flowers obtain their nourishment. This tuber was in existence the previous year, whilst the other and smaller tuber is the store for nest year’s plant, and stores up the nourishment obtained by means of its fibrous roots and the leaves. Thus this plant can get to work to form leaves and flowers as soon as conditions permit and independently of its fibrous roots. Just above the surface of the ground the Butterfly Orchis produces two fairly large, glossy green leaves, from the middle of which springs the flower stem. This tem has one or two scale-like leaves and its surmounted by a dense spike of creamy, sweetly-scented flowers. The chief insect visitors to this plant are certain species of Hawk Moths, whose long tongues alone can reach the nectar secreted in the long spur. The cream-colored flowers are a good guide to those night flying insects, but to aid them still more effectively the sweet, clove-like perfume is much stronger in the evening than by day. We are now in a position to examine the individual flowers and see now they are specialized for their insect visitors. The flower consists of six floral leaves, which are all petal-like and are arranged in two whorls of three. Of the three outer ones, one is directed upwards whilst the other two are spreading. Of the inner three, two are small and are situated in front of the upwards pointing outer one. The third points downwards and forwards and is known as the labellum. It is larger than the other segments and in many species of orchis is the platform on which the insect visitors alight. In this particular orchis, however, the labellum is hardly large enough to accommodate large insects. Hawk moths hover before the flower and have no need to alight in order to obtain the nectar, hence a landing stage would be redundant. The base of the labellum is produced backwards to form a very long and narrow spur at the base of which the nectar is secreted..
All British orchids, except the very rare Lady’s Slipper, possess only one stamen. The single stamen is united with the style of the ovary to form a short column of which the anther is the apex and the stigma is the base, and is situated directly over the entrance to the spur. The anther produces no pollen dust as in ordinary flowers, but tow club-shaped bodies mounted on short stalks and attached by two adhesive discs. The upper portion of the club is known as the polonium and consists of a mass of pollen united together by elastic threads. When these pollinia are ripe they are easily detached and may be removed by a needle to which they attach themselves by the means of the adhesive discs. The polonium when detached first stands erect, but shortly afterwards the stalk bends until the club-shaped portion is pointing in a forward direction. All these specialized organs are designed towards cross-pollination. A moth seeking to push its proboscis into the spur may quite easily detach one or both the pollinia which adhere to its head or antennae. One can often trap moths whose heads are covered with these small club-shaped bodies. Before the insect arrives at another flower the pollinia have bent forward and on its arrival are in the exact position to make contact with the stigma and so effect cross-pollination. It is impossible for the Butterfly Orchis to be self-fertilized and it is thus absolutely dependent on insect visitors. Almost all orchids are dependent on insect for cross-pollinaton and often the scarcity or frequency of a species in a particular area depends on the numbers of its particular insect visitors in that area. The plant has also made sure that pollen from another plant shall fertilize its blooms, and to this end has arranged its flowers in a spike. The lower flowers open first and a moth always commences at the bottom of the spike and works upward to the higher newly-open flowers. From these upper flowers it becomes covered with pollinia, which it transfers to the lower flowers of the next flower it visits. Another feature which is common to most orchids is the fact that the ovary is twisted and the whole flower is actually reversed so that in reality the labellum is the upper petal. This lovely little orchis belongs to the same genus as the Butterfly Orchis. It is fonder of the wilder, more sterile pastures up to about 600 feet, and in Lochaber is common in many such areas along with the Small Orchis, Heaths, Sedges, etc. It has the same type of rootstock as the preceding except that the tubers are divided into two or three lobes. The stem, which is about one and a half ot two feet high, has several long, narrow leaves, and is crowned by a dense spike of small, bright rose or purplish-red flowers which have a very sweet vanilla-like perfume. The floral parts are small with a fairly broad three-lobed lip. The spur is very long and slender, and is obviously constructed to preserve the nectar for long-, very slender-tongued insects such as the smaller types of hawk moths. This species, although belonging to the same genus as the preceding two species, is constructed rather differently. Instead of the tuberous roots we find that the roots are composed of several thick fibres which may be united, in some cases, into a deeply divided tuber. The stem is only six to eight inches high and is clothed with a few small leaves which are glossy in texture. The stem is surmounted by a dense spike of small cream-colored flowers which are very sweetly scented. The flowers have a three-lobed lip and a very short spur. This short spur indicates that shorter-tongued insects, such as bees, must be the chief visitors for the nectar is easily obtained by them. It is quite a common flower in many of the lower pastures bordering the meadows along the shores of Loch Linnhe and I have found it in similar situations in many other spots in the western Highlands. The Frog Orchis which, by the way, bears little resemblance to that animal, is fairly common in the grassy pastures and meadows and is frequently found in the Spey Valley. It is not an easy plant to find as its greenish flowers render it inconspicuous among the grasses. The stem produces a few ovate, smooth leaves and is terminated by a close spike of flowers. The sepals are large and form a head over the column. The lip is long and hanging and of a yellowish colour. Nectar is secreted in a little pouch near the summit of the lip just below and in front of the stigma, and also by two lateral nectarines. The pollinia in this species take a considerable time to become depressed, this being correlated with the time lost in visiting three nectarines in each flower. The nectar is accessible to short-tongued insects. The Spotted Orchis is a very common plant in the Highlands and one may find its showy spikes of flowers in damp meadows, in rough mountain pastures, on the edges of thickets and on banks and roadsides from sea level to 1,500 feet. The finest specimens of this orchis that I have ever seen were in a damp, green meadow beside Loch Linnhe, where the steep hillsides leaves but a fringe of level ground between their rough sides and the sea, and where tiny streams run musically through the smiling meadows to the sea. These field were filled with orchids, but especially with the Spotted Orchis whose handsome spotted leaves and huge, beautifully marked spikes of flowers made a scene of beauty so remarkable that I shall never forget it. Scattered among them were the short purple spikes of the Early Purple Orchis, the deeper purple spikes of the Marsh Orchis and the beautiful scented spikes of the Butterfly Orchis. The Spotted Orchis possesses a fairly large, tuber-like root which is divided into two or three lobes. This is the storehouse where energy for an early commencement of life, after the cruel winter has passed, is stored. The tubers send up a tall solid stem which attains a height of about one foot. The leaves, which are mostly radical, are lanceolate in form with a bright and shining surface beautifully marked with dark purple or black spots. The flowers are formed in a dense terminal spike, which may be as much as three inches in length in luxuriant specimens. They vary much in colour, sometimes being white, more commonly pale pink, and often of quite a dark shade. The flower consists of three dark colored sepals which are spreading. The upper petals form an arch over the column, thus protecting the pollinia from rain The lip is broad and usually three-lobed, much spotted and variegated with deep rose, or even purple, and forms a find landing stage for insect visitors. It is produced backwards to form a log spur which contains the nectarines. The pollination of these flowers is very similar to that of the Butterfly Orchis. The flowers, however, are only faintly scented and their colouring show that large bees and butterflies are the chief benefactors. Especially the latter, as very few bees possess a tongue long enough to reach the nectarines at the base of the long spur. Modern botanists now dive O. maculata into two species known as O. ericetorum and O. Fuchsii. The first is confined to peaty soils with an acid reaction and is the Spotted Orchis found on moorlands and health places. It is distinguished from O. Fuschsii by its broad, pyramid-like spike of flowers, and by the middle lip of the flower being small and narrow and the spur slender. O. Fuschsii prefer less acid soils and is the Spotted Orchis of damp meadows and pastures. It is usually a taller, more robust species than the preceding, with a cylindrical spike of flowers which are much marked with dark purple lines and spots, whilst the spur is stouter than in that species. A white form of great beauty occurs, but it is very rare. The Marsh Orchids are found in similar places to the Spotted Orchids, but also prefer wetter places such as the marshy edges of lochs and streams. The old botanists only distinguished tow species of Marsh Orchids, but today they are divided into several species Two them, O. incarnata and O. praetermissa, are locally common in the Highlands and are sometimes accompanied by a third and much rarer species, O. pupurella, which has a very limited distsribution. These species are not very easy to distinguish, and their diagnosis is complicated by the fact that hybrids between the Spotted Orchids and the Marsh Orchids are very common. The Crimson March Orchis (O. incarnata) is a beautiful species, and when seen in masses, as one can often find it in boggy meadows, it makes a fine display. It stands out well among the marsh vegetation, as its stems often reach two feet in height and are terminated by dense, cylindrical spikes consisting of many flesh-colured or pink flowers. The lip is faintly three-lobed and its margin is reflexed and marked with dark spots and streaks. A magnificent, rich purple variety occurs, but unfortunately it is very rare; this the variety pulchella. The Common Marsh Orchis (O. praetermissa) is also fairly common in certain parts of the Highlands, more so on the eastern side. It is distinguished from the preceding by its darker colored flowers. The third species, O. purpurella , is distinguished from the other two by its stem, which is more than half solid, and by its purple flowers and its almost entire lip. This orchis is another inhabitant of the moist meadows, but it is often found in open woods and thickets. It possesses undivided tubers, which send up stems to about one foot in height. The broadly lanceolate leaves are spotted, although in some species these spots may be absent. The flowers are produced in loose spikes, which may sometimes be as much as six inches in length. The flowers vary much in colour to flesh colour, and even white. The lip, which is sometimes downy in the centre, is curved down at each side and extended back into a broad spur. They are pollinated n a similar manner to the Butterfly Orchis, except that the chief benefactors are bees and butterflies, especially bumble-bees.